KUOW reporter John Ryan’s hard-hitting series about Puget Sound Partnership concluded today with a look at the findings of the Washington State Auditor’s Office. Today’s piece, like the entire series, emphasizes the mix of state business and personal connections of Executive Director David Dicks and his father, U.S. Rep. Norm Dicks. The first story focuses on a “whistle-blower” who brought allegations of impropriety to the attention of the state auditor; the second piece addresses David Dicks’ use of a state car; and the third deals with perceived conflicts of interest resulting from the senior Dicks funneling money to the Puget Sound Partnership. No matter what you think of the Puget Sound Partnership, the series provides some important insights into the organization. I’m occupied by another project at the moment, but I’ll try to keep tabs on this issue and see how it plays out. Bill Ruckelshaus and David Dicks, major figures in the Puget Sound Partnership, are in Washington, D.C., today with a delegation calling on top federal officials to take action on ocean issues. Among others, they are meeting with Jane Lubchenco, administrator of the National Oceanic and Atmospheric Administration. 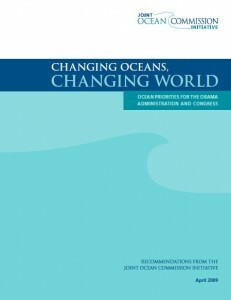 Ruckelshaus, a member of the U.S. Commission on Ocean Policy, told me four years ago that the oceans are so important that he would never give up working to invigorate the nation’s laid-back approach to ocean issues. I heard a similar commitment from retired Navy Adm. James D. Watkins, who now heads the Joint Ocean Commission — a consolidation of the U.S. Commission on Ocean Policy and the Pew Oceans Commission. The recommendations, to be sure, are not much different from separate reports issued by the two commissions in 2004. 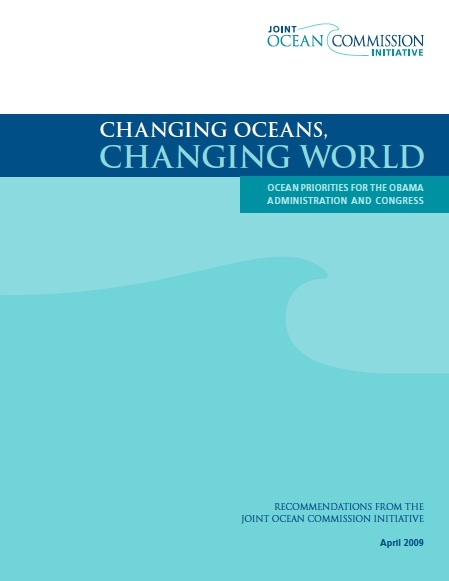 The Joint Ocean Commission released a report today titled “Changing Oceans, Changing World: Ocean Priorities for the Obama Administration and Congress” (PDF 280 kb). Few issues separate people into two groups as much as shoreline management regulations. We are guaranteed to have a lively debate in Kitsap County and in jurisdictions throughout the Puget Sound region beginning later this year and possibly continuing for the next three years. See my story on this issue in Sunday’s Kitsap Sun. None of this will matter when a KC employee can give a variance from the 100′ buffer down to 10’… and change the 20′ road rule down to 6′ from the road…both variances done for the same property. If the county or state wants to tell us what we can and can’t do with our waterfront property, then why don’t they pay part of our property taxes which are already inflated. yep…Government intrusion into our lives and property has already become suffocating. the next 4 years will be epidemic. it is so sad that the democrats have a stranglehold on life, liberty and the pursuit of happiness. Too bad the shorelines here are largely private, rather than public, as in Oregon. Puget Sound could be lovely — instead it is a disappointing cesspool. In many places you can’t even see it for the homes and fences that block views, including the views of those who formerly could see it from their homes. Let’s not kid ourselves. There is no such thing as private property and hasn’t been since at least 1971. The government, and especially the ‘Garridoites’ and their ilk that think it all belongs to them and their band of land grabbers. Regulating shoreline uses is a hot topic because the property is at the pinnacle of value, both in terms of land costs and in terms of ecosystem processes. Many land owners think they can protect the environmental values of their property without governmental interference, and they get tired of the regulations getting more and more restrictive over time. On the other hand, the decline of the Puget Sound ecosystem has created an urgency to protect intact or even damaged shoreline ecosystems. As David Dicks, executive director of the Puget Sound Partnership, said today on KUOW’s Weekday, the solution to cleaning up Puget Sound relies on some combination of regulations (cheaper for the government) and purchase/restoration (which costs the government more but can be more acceptable in some ways). In that same broadcast, Bill Ruckelshaus, chairman of the Partnership’s Leadership Council, talked about how it can be easier during an economic downtown to purchase lands important to the ecosystem. But it’s also a time when government budgets for such thing are the tightest. “Ecosystems are not indivisible from human habitation and there are a lot of humans that live in Puget Sound, and there’s going to be a million and a half more by approximately 2020… We can’t treat the other living things as though they are separate from us humans. The KUOW broadcast, by the way, includes some new information about using the federal economic stimulus money for environmental restoration — such as moving up removal of the Elwha dams to 2010. Under the current schedule, the federal money won’t be available until 2012. I’ll be covering this issue in more detail later.